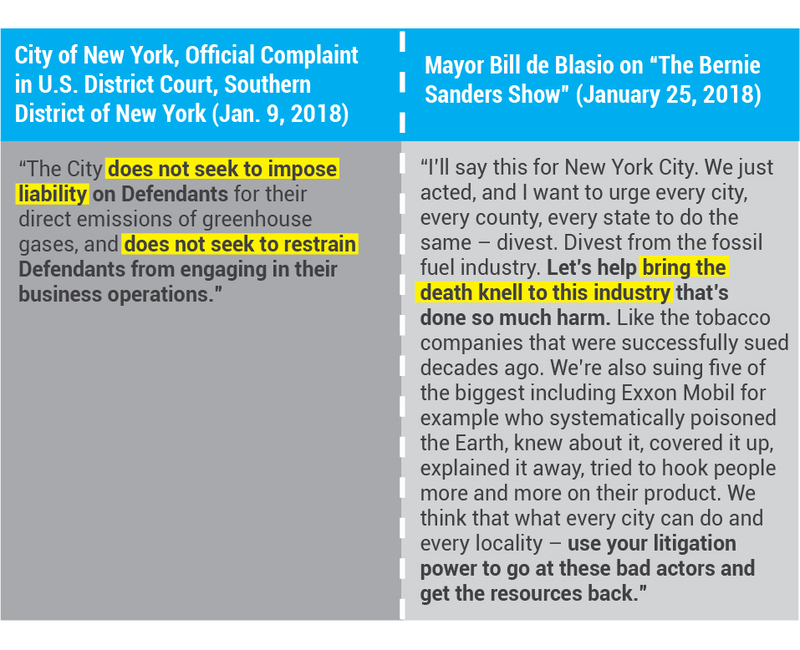 New York City Mayor Bill de Blasio made some alarming comments on Senator Bernie Sanders’ podcast this week about his recent climate lawsuit against the energy industry – comments that contradict a key part of the lawsuit itself. Mayor de Blasio told the Vermont socialist that he wants his lawsuit and divestment proposal to “help bring the death knell” to fossil fuels, including the oil and gas industry. He also hopes to extract “billions” of dollars from them in the legal process. Mayor de Blasio, call your office. The fact that the Mayor specifically linked his “death knell” comments to the city’s lawsuit and divestiture plan leaves little doubt about what he and the city were trying to achieve with those actions, even if the city claimed otherwise in its official filing. Indeed, New York City’s actions were never about responding to unlawful activity or even mitigating the risks of climate change. Public officials like Mayor de Blasio and New York Attorney General Eric Schneiderman – along with their “brother and sister activists” – want to shut down energy producers. That’s going to be very painful for their constituents, though, as the New York Times reported last year that the majority of NYC’s power comes from natural gas, not to mention the caravan of de Blasio’s idling SUVs that run on gasoline. Also notable in Mayor de Blasio’s comments to Senator Sanders is his admission that it’s all about the money. “We’re looking for billions,” he said on the podcast.